In terms of painterly invention, few can keep up with Albert Oehlen, the German artist whose relentless reinterpretation of the medium has made him one of the more intriguing, and often unpredictable, guardians of the form. Moving effortlessly from visceral abstraction to coy installation work and back, few elements of visual culture have avoided his scope over the past 30 years. 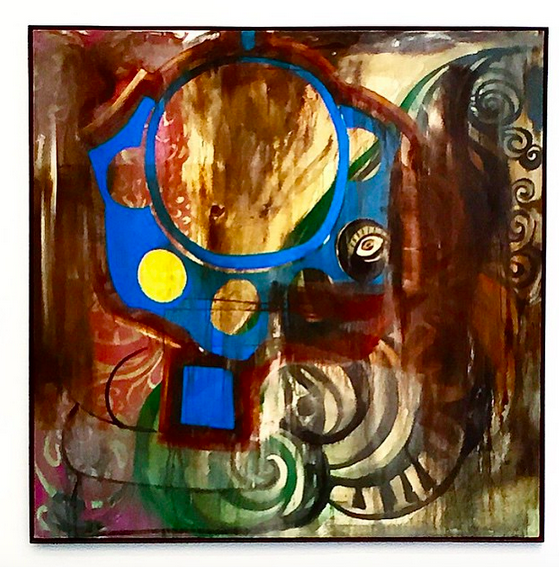 This drive towards the investigation of the image, and its potentials in an increasingly mediated world, sits at the center of Oehlen’s New Museum retrospective this summer in New York, combining a carefully selected series of works that move from his early recognition during the 1980’s through to the present day. Taking up the third and fourth floors of the museum, the exhibition presents an admittedly brief collection of the artist’s compositions from the course of his career. 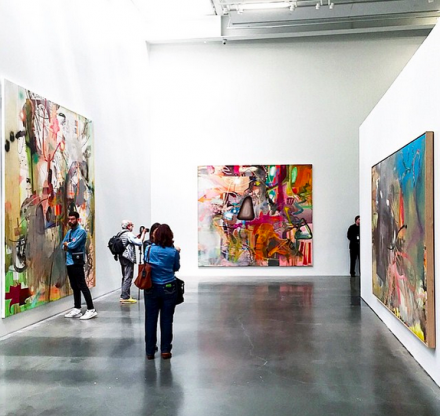 But what the show lacks in depth, it makes up for with impressive breadth, tracing Oehlen’s frequent stylistic shifts and philosophical inquiries into the act of painting in a world inundated with images. 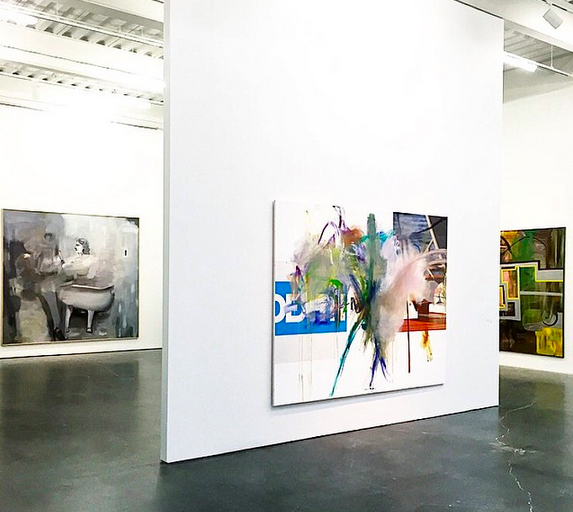 Much like his German contemporary, Martin Kippenberger, Oehlen’s work often seems to tie itself up in the space between the painter and the work itself. Human body parts, cultural icons and even the gesture of painting is presented in grotesque inversions, as with one series of works depicting the artist with perversely immense hands, awkwardly fumbling with the work he himself is attempting to realize. 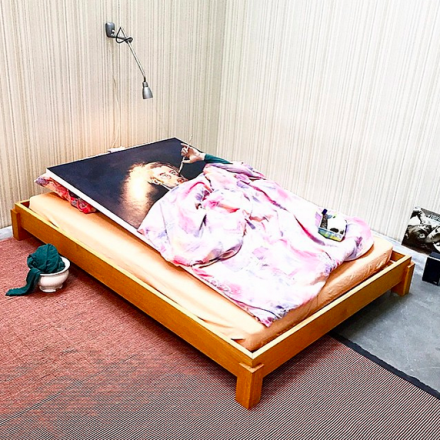 In another, the comical installation, Untitled (2005) Oehlen places his self-portrait under bed covers in a replica bedroom, complemented with records, a hot plate, and even a false hand reaching up to the canvas, as if the art was completing itself, and completing the artist’s self-reflection in turn. Throughout, the artist’s efforts at translation seem doomed to a sort of nether space, as if all his efforts could never bridge the gap between artist and viewer as intended. This interest seems to refine itself as the exhibition continues, moving over to Ohelen’s series of manipulated advertising works and digitally-focused paintings. 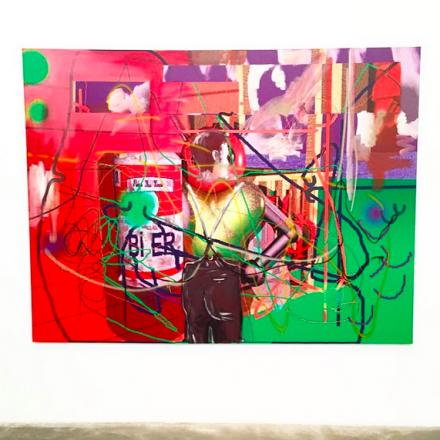 Including fragments of public advertising, slurred with huge strokes and slashes of paint, the artist takes the modes of commodity culture for their own deconstructed tour through the canvas, often following in footsteps initially laid by his mentor Sigmar Polke. 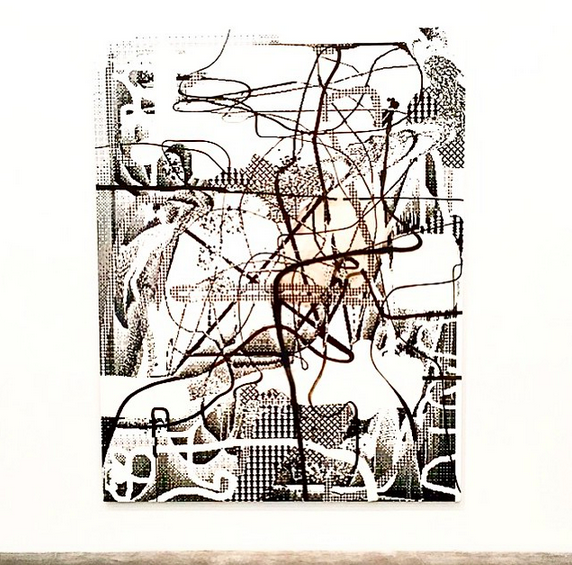 Polke’s studies on line and mark, as expressed in advertising and other mainstream modes of visual communication, find a new birth in Oehlen’s approach, which aggressively mines the dissonances that these juxtaposed images and techniques exist within. Similarly, a series of works on the third floor make light reference to Polke’s screen-printed patterns, yet are executed from sketches on a Texas Instruments calculator, which were then repainted by the artist. Exploiting the early textures of digital graphic-making, both in the pixelated roughness of their execution and the often abstract possibilities of the graphic programs used to create them, Oehlen opened a door to painting’s interfacing with the modes of seeing created by the digital image, a discipline that seems to be flourishing among young artists today. This technique, and the other more traditionally leaning approaches illustrated on the third floor, reach their point of cohesion on the fourth, presenting a series of the artist’s more recent paintings. Combining digitally printed, colorful lines and images countered by his own attempts at collage and painterly abstraction, the final canvases of the show seem to explode with a renewed energy, as if Oehlen’s fascination with the flaws of the medium ultimately pulled him towards a new language entirely, one that’s immediate, violent, and often quite comical by turns. Home and Garden is on view through September 13th. 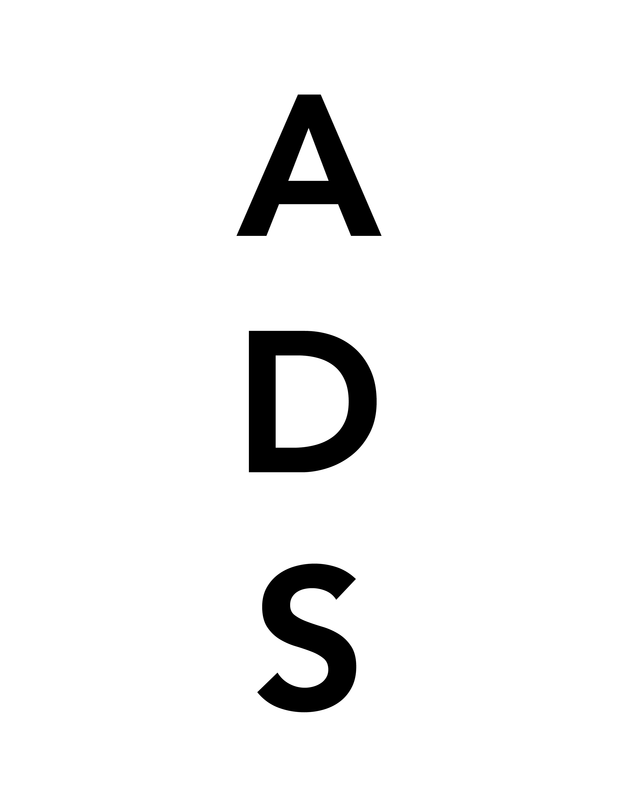 This entry was posted on Friday, July 17th, 2015 at 12:00 am	and is filed under Art News, Featured Post, Show. You can follow any responses to this entry through the RSS 2.0 feed. You can leave a response, or trackback from your own site.